The Swedish police closed down the bittorrent tracker the Pirate Bay on Wednesday and on Thursday hackers went after the website of the Swedish police. The website was closed late Thursday after a denial of service attack. Tonight hackers were able to put the website of the Swedish Government out of business. As of this morning the site is still not up. 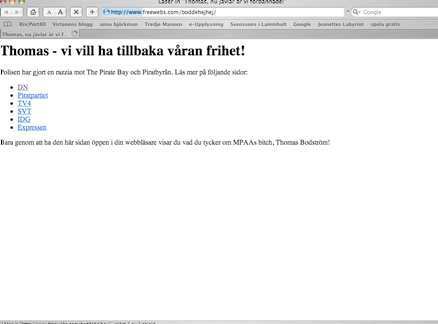 For a while a message to Minister of Justice Thomas Bodström was up on the site: “Thomas – we want our freedom back”. Aftonbladet has the screen dump here. Tags: pirate bay, hackers, police, Pirate Bay.